The summer of 2018 offered a slew of exhibitions, programs, new publications, and criticism surrounding the work of David Wojnarowicz. The Whitney Museum’s retrospective, History Keeps Me Awake at Night, was the epicenter of activities, with several concurrent exhibitions elsewhere, including PPOW Gallery’s Soon All This Will Be Picturesque Ruins: The Installations of David Wojnarowicz and NYU’s The Unflinching Eye: The Symbols of David Wojnarowicz. 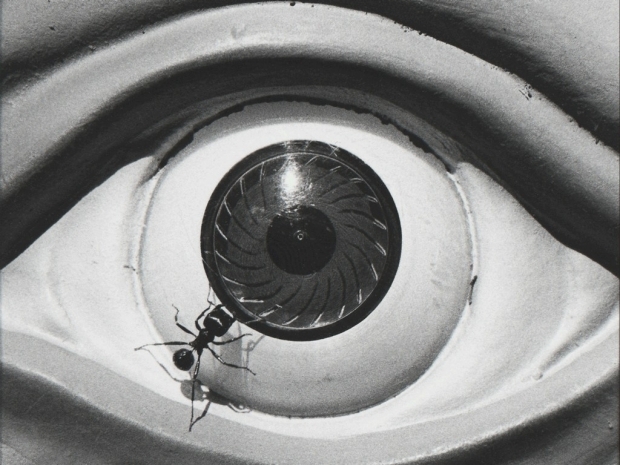 Untitled (eye with ant), 1988. Silver gelatin print courtesy of PPOW Gallery. To mark the closing of The Unflinching Eye, NYU’s Nicholas Martin welcomes Whitney curator David Kiehl, PPOW Co-founder Wendy Olsoff, and NYU Contributing Curator Hugh Ryan for a reflection on these disparate exhibitions, how they complement and contrast with one another, and how the events of this summer reflect and build upon Wojnarowicz’s legacy here in New York and the world over. NYU is grateful to the Keith Haring Foundation for its support of The Unflinching Eye.